Once again this year, we are proud to be supporting the Race Around Ireland, Europe’s toughest cycling endurance race. We will be providing custom cycling jerseys, given to all competitors and we will be there exhibiting for anyone interested in speaking to us about supplying their custom cycling or triathlon clothing. 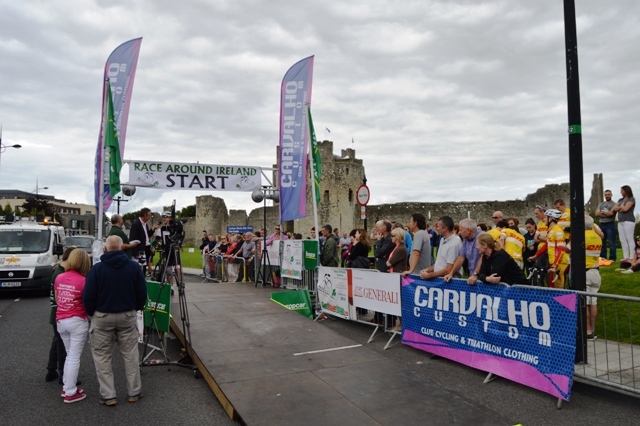 The Race Around Ireland starts on 28th of August this year and is a bike race of monumental proportions, with 2150 kms of non-stop racing, to be finished in 132 hours. Considering the enormity of the challenge, it is incredible that every year there are more entrants and indeed, the race is pretty much up to capacity now, so if you think you have what it takes, then you need to put your name down for 2017 asap! For those of you who don’t fancy riding the race alone, there is the option to ride in twos, fours or eights. We get all sorts of strange requests for custom tri suits here at Carvalho Custom and some of them can be quite challenging for us to produce. 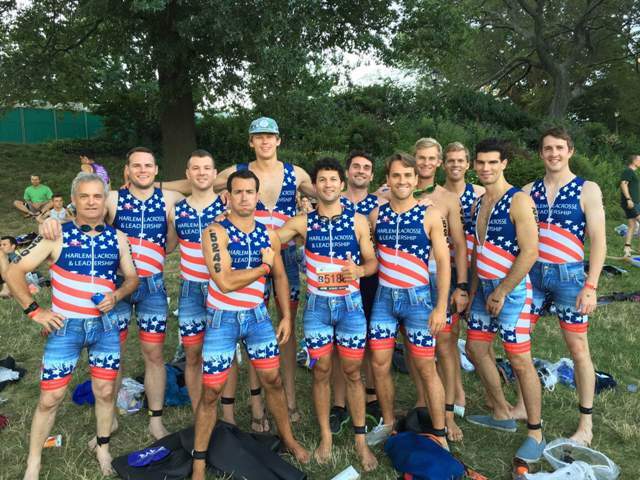 When the Harlem Lacrosse and Leadership triathlon team said that they wanted their custom tri suits to look like they were wearing jeans, we knew it would be a bit of a challenge, but we think it came out pretty well. We will leave you to make you own mind up…..
Whatever you think about the design of their triathlon suits, there is no doubt that Harlem Lacrosse and Leadership is a fantastic organization: it is a non-profit youth service organization that uses lacrosse to engage roughly 300 at-risk children from low income areas of New York City, providing a safe, structured environment for children to compete, learn and develop into future leaders in their communities. Carvalho Custom salutes you and all the other organizations round the world looking to make a difference through sport. 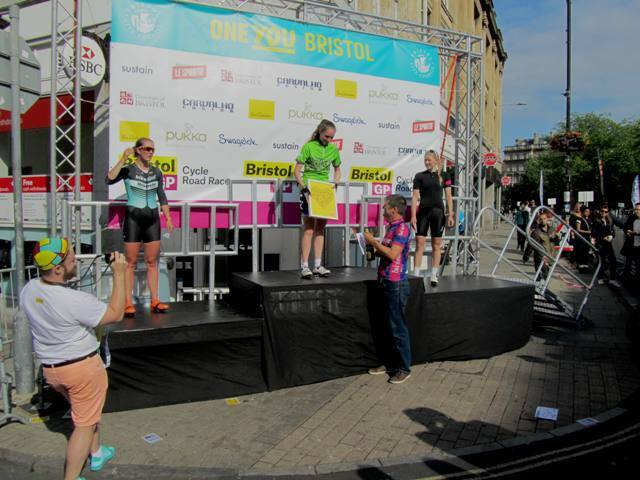 We have just come back from the Bristol GP, where we sponsored the women’s racing and exhibited in the race village. It was an extremely well run event, with a cracking atmosphere and even the sun came out. As a cycling clothing brand, it is great for us to put something back into the sport and help it grow and we look forward to coming back to Bristol in future years. With the work we have done developing our custom women’s cycling clothing range and in particular our patent pending halter neck shorts, we are particularly happy to get involved with supporting women’s racing. We get a lot of requests for charity cycling jerseys, particularly from the UK where charity cycle rides are so popular. So we have just launched a low cost custom cycling jersey which although it does not include any of the more advance features like mesh lycra side panels, silicone body grippers, carbon thread moisture control and so on, it is a fantastic basic custom cycling jersey. It is very sturdy, lightweight, prints with strong vibrant colours and has 3 back pockets like a standard jersey. 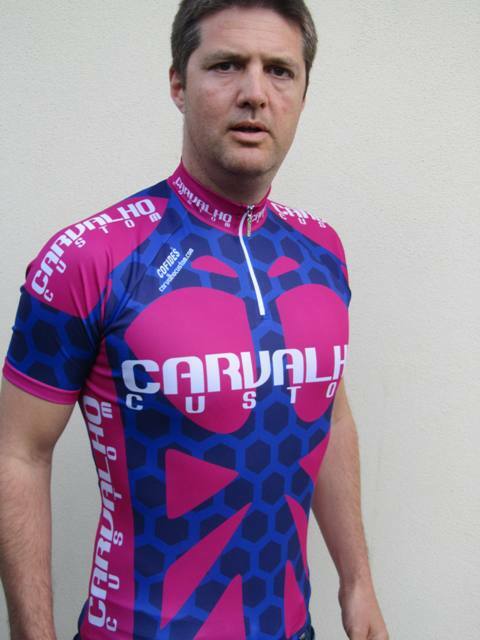 We are able to make these charity cycling jerseys for €19.90 each (ex VAT), based on an order of 100, which it makes it one of the most competitively priced jerseys on the market for a strong, reliable quality product coming from a reputable charity cycling jersey supplier. We can make smaller quantities, but the price would be higher. There are some Wicklow 200 jerseys available to buy at the event registration area on Saturday and Sunday, but there are not many left and it is first come first served. Price is €40. 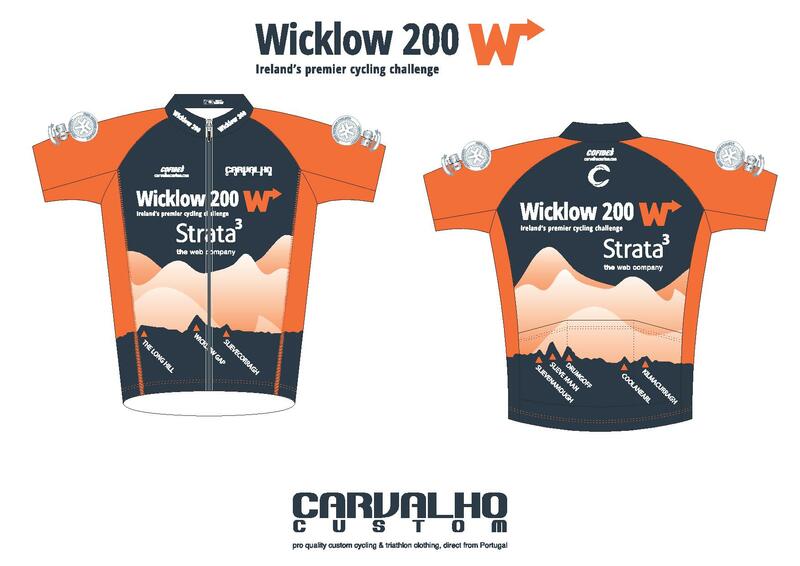 You may know Carvalho Custom as one of the sponsors of the Race Around Ireland – we supply direct from Portugal into principally northern European markets, offering pro quality kit at southern European prices. 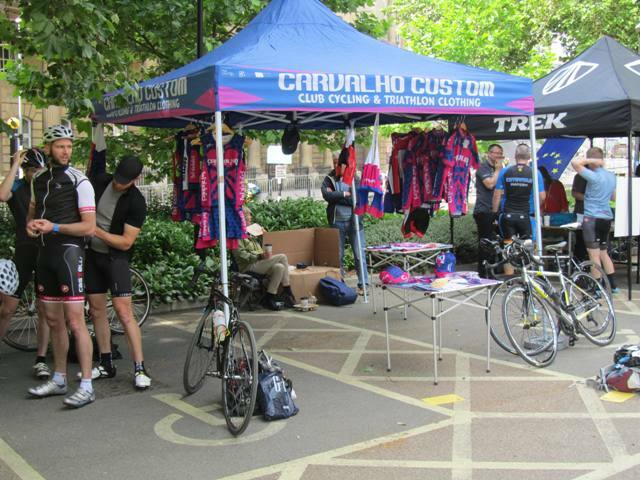 If your club might be interested in getting a quote from contact us for club cycling or triathlon kit. Our patent pending halterneck bib shorts are selling like hot cakes! It has taken a while for female cyclists to wake up to the idea of using a halter strap for their bib shorts rather than male style bib shorts with conventional “braces”, but the revolution is now officially underway. In case you have not yet heard, using a halterneck strap allows the shorts to be pulled down at the back without removing the jersey (or removing the strap from round the back of your neck), which means it is a whole lot easier to go to the loo. You can see that we use a thick and very stretchy strap that goes round the back of your neck so that you do not feel the strap pulling down on your neck when you are riding. The strap is so stretchy that when you want to pull the shorts down, you can just crouch over to help release the tension on the straps and then the shorts will just pull down at the back. 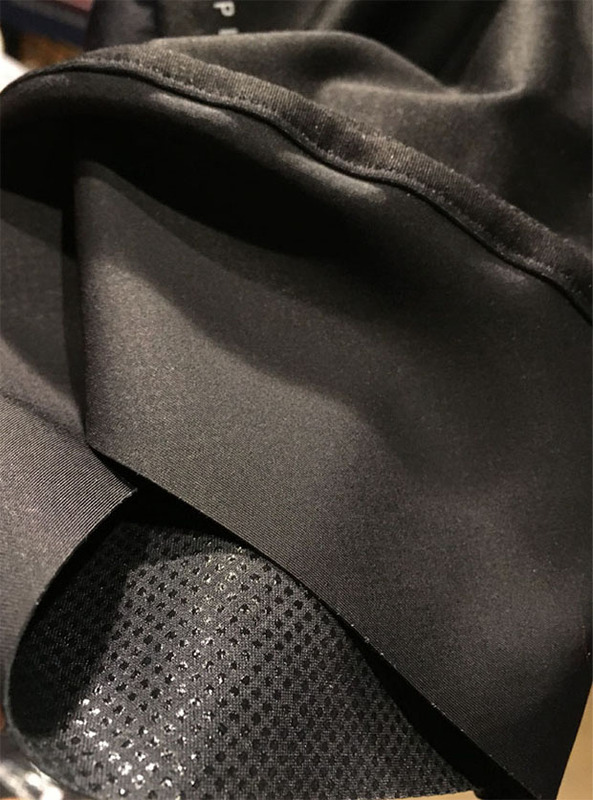 We also use laser cut silicone coated leg grippers and a foam injected chamois, to make the comfort of the shorts complete! If your brand is interested in using our patent under license, please contact Charlie at Carvalho Custom for more information. We put in an a lot of work to constantly upgrade our fabrics and we have a new fabric, Ultra Power, for our cycling shorts. It is super soft, comfortable and breathable whilst offering an optimum degree of compression; it also allows us to print brilliant bright colours and the colours do not dull even when the Lycra is stretched. We have started using Ultra Power for our EVO custom cycling shorts and our patented female halterneck cycling bib shorts. Here is a video explaining about our new custom tri-suits with the new tri-skin fabric, which is hydrophobic (water-repellent), to cut through the water faster and super fast drying as water beads off. It is also extremely lightweight. Available in both male and female versions, with laser-cut silicone leg band grippers as optional. 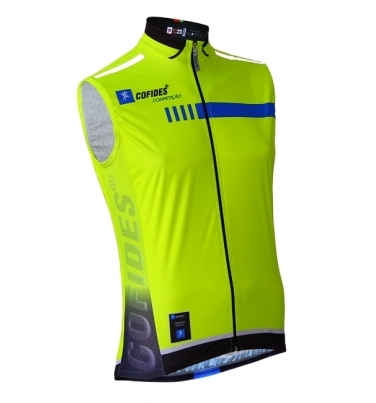 We have added fluorescent yellow to the colours available for our entire range of custom cycling clothing. We also have silver reflective strips that can be added to existing designs to make you more visible in murky conditions – these are typically added to the backs of jackets and on shoe covers. If you need help with developing or improving your club cycling clothing design, then please get in touch with us and one of our graphic designers will work with you directly to come up with a fantastic looking design. We do not charge any extra for this development work.